This past week I noticed we had some new neighbors move in on our little cul-de-sac. I realized quickly that the family was from India based on their dress. Filled with excitement, I went over to meet them and introduce myself. Later that day I was on a walk with my little granddaughter, Selah, and our new neighbors drove by. I waved and smiled, and that sparked a conversation with Selah. Selah asked why they wore the clothes they did, and I explained they were from India. I then went on to explain that there are many people who don’t know Jesus in India. (Now don’t misunderstand—there are many who do know Jesus in India, but there are also more unreached people groups in India than anywhere else in the world!) Selah didn’t miss a beat. She said, “Oh Mimi, you need to tell them about Jesus like I told my friend about Jesus in kindergarten!” I loved that moment in our conversation. Here was my 6-year-old granddaughter reminding me that I am called to live as a “sent one” to show and tell others about the love of Christ. 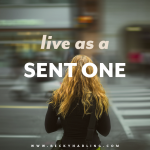 You are called to live as a “sent one” as well. A part of your purpose is to show and tell others about the love of Christ. Before Jesus ascended into heaven, He commanded all of us to “Go and make disciples of all nations, baptizing them in the name of the Father and of the Son and of the Holy Spirit” (Matthew 28:19). Our goal is clear: Make disciples of Jesus. So in the chaos of everyday life, how in the world do we do this? I mean, not everyone can go overseas. Not everyone can be paid to be a missionary. Still, the calling is clear: You are called to live as a sent one – one who shares the good news of Christ’s love with others. So what does this look like? Here are a few ideas. Know your neighbors and pray for them. Inside one of our kitchen cupboards, I have the names of all my neighbors. With how much Steve and I travel, it would be easy to forget their names. I can use that list as a prayer guide. I can pray for every couple on our cul-de-sac by name. I pray that opportunities will open for me to love them well. I pray for them to see Jesus in Steve and me. I pray that ultimately they will come to know and trust Christ’s love for them. When you’re out walking, make it your practice to pray for your neighbors. Pray specific verses of Scripture for them. And do the same for your co-workers. You are positioned by God at your job and in your neighborhood to be Jesus to those around you. View the Refugee Crisis as An Opportunity to Share Christ. Because of the worldwide refugee crisis, we have more opportunities than ever to reach people who before were unreachable for Christ. Consider this. What if the refugee crisis was God’s idea? What if He was bringing people to our doorstep so that we’d have easy access to them to share His love? Friend, don’t let fear hold you back. Be bold about loving others and sharing Jesus with them. Learn to Listen to Understand. Don’t assume that your culture is the best. Instead, be intrigued by other cultures and learn to listen to understand. There are so many beautiful cultures with difference and commonalities. Seek to understand. Don’t judge. Make it a point to ask questions. Jesus left the beauty and glory of heaven to enter our messed-up culture. He walked with people, partied with people, and asked great questions. He understood that at the core of every person there was the deep need to feel loved. People feel most loved when they feel heard. Take time to listen this week and love on those who live in your neighborhood and who work in your office. Remember, you are called to live as a “sent one.”You’ve been sent by Christ to be Jesus to the world around you! I’m home this week writing, enjoying grandkids, catching up on appointments, and enjoying life! Please pray as we get ready to launch the video series for Who Do You Say I Am? Please pray as Steve and I work on the joint writing project (more information coming later!). Please pray as I line up my Fall 2018 and Winter 2019 schedule.